Christian Couple Killed By Mob In Latest Pakistan 'Blasphemy' Case : Parallels In multiple instances, people accused of blasphemy against Islam have been killed or faced serious legal punishment despite evidence that is flimsy or nonexistent. 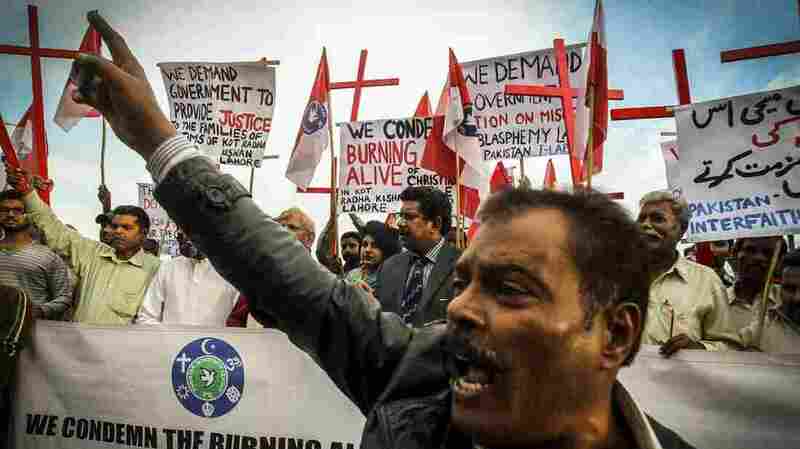 Pakistani Christians in Islamabad protest the killing of a Christian couple who were burned alive for alleged blasphemy. Pakistan has had multiple cases of vigilante killings against people accused of blasphemy against Islam. In the latest vigilante attack based on an accusation of blasphemy, a young Christian couple in Pakistan was beaten by a mob and then incinerated at a brick factory. There have been multiple cases in recent years in which Pakistanis are accused — often with little or no evidence — of committing blasphemy against Islam. The police officer in charge of the investigation, Inspector Maqbool Ahmed, says he was told by local residents that the couple was still alive when they were shoved into a brick kiln. By then, the husband and wife, Sajjad and Saima "Shama" Massih, were severely injured, having being beaten up by a crowd that set upon them when reports circulated alleging that they had defiled Islam's sacred book, the Quran. According to Ahmed, more than 40 people have been arrested and are being questioned about the killings, which happened in a rural community in the province of Punjab, about 40 miles outside the city of Lahore. The murders were described as "an act of sheer barbarism" by Joseph Francis, a prominent activist who campaigns on behalf of Pakistanis accused of blasphemy. Pakistani activists and members of the Christian minority light candles to protest the killing of a Christian couple who were burned alive after being accused of blasphemy. The protest took place in the capital Islamabad on Wednesday. "We demand that the government sets up a judicial commission and thoroughly investigates the matter," says Francis. "It must bring the perpetrators to justice." Reports from the area suggest that the allegations of blasphemy against the couple began to circulate after the husband, Sajjad Massih, had a financial dispute with his employers. "Falsely accusing Christians of blasphemy has become a routine," says Francis, who heads Pakistan's Centre for Legal Aid Assistance and Settlement. "No false accuser has ever been punished. Such impunity has led to a surge of such incidents." Punjab's chief minister has reportedly set up a three-member committee to investigate the murders. Police are under orders to beef up security in Christian neighborhoods in the province. The killings come less than a month after an elderly, mentally ill British man, who is on death row in a Pakistani prison for committing blasphemy, was shot and injured by a guard. 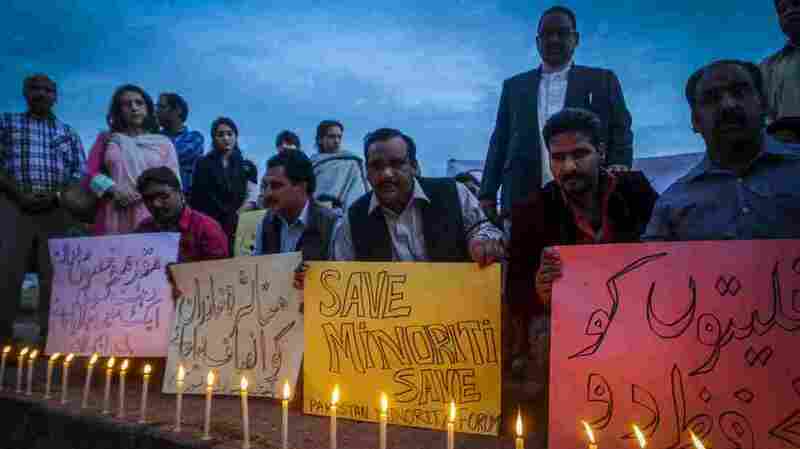 The victims of such blasphemy-related vigilante attacks are often Pakistan's minority communities — including Christians, Hindus, and Ahmadis — although members of the mainstream Muslim majority have also been targeted. There was an international outcry in 2011 when the provincial governor of Punjab and Pakistan's federal minorities minister were assassinated, in separate incidents. Both men had calling for reforms in Pakistan's blasphemy laws, and spoke in support of Asia Bibi, the first woman in Pakistan sentenced to death for blasphemy. Bibi is a Christian and a mother of five who has spent four years on death row after being accused of blaspheming during an argument with co-workers at a fruit farm. Her lawyers are currently preparing to appeal against her conviction before Pakistan's Supreme Court. Pakistan's blasphemy laws are also a source of concern among human rights organizations and others. Activists say anyone who is accused can be arrested on flimsy evidence, and detained for years without bail. They say the laws are increasingly exploited by people pursuing private vendettas over issues such as money, property, or politics. The issue of blasphemy is so sensitive in Pakistan that most Pakistani politicians and officials prefer to avoid publicly discussing it because of the dangers involved. In May, a leading human rights lawyer was shot dead after agreeing to defend a Muslim university teacher accused of blasphemy.